A federal lawsuit against Orleans Parish District Attorney Leon Cannizzaro and several of his prosecutors — alleging that they violated people’s civil rights through the use of fake subpoenas and unlawfully obtained arrest warrants against witnesses and crime victims — will be allowed to go forward. 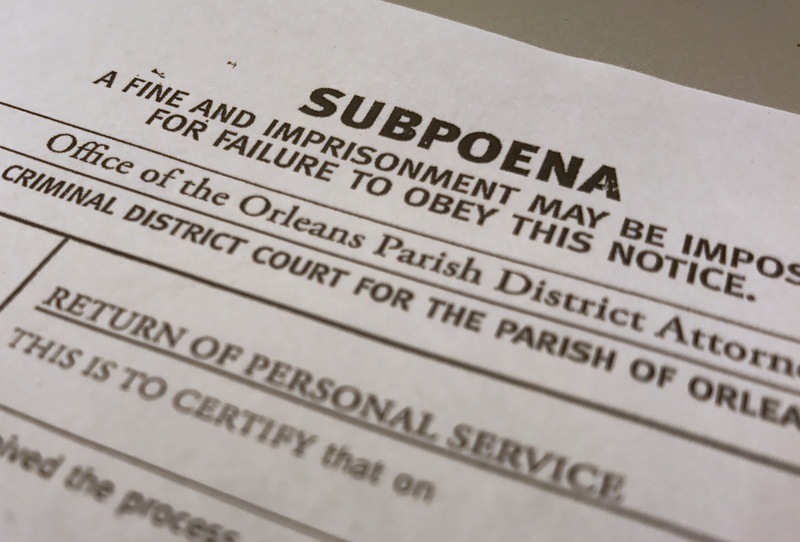 Calling the use of fake subpoenas cited in the lawsuit an allegation of “systematic fraud,” federal Judge Jane Triche Milazzo on Thursday issued a ruling that rejected much of Cannizzaro’s request that the case be dismissed. The lawsuit was filed in October 2017 by the ACLU and the Civil Rights Corps on behalf of seven people who were issued fake subpoenas, arrested for allegedly failing to cooperate with prosecutors or both. Tiffany LaCroix, a girlfriend of Cardell Hayes, received a fake subpoena weeks before Hayes’ trial for killing former Saints player Will Smith. Hayes was convicted of manslaughter. Fayona Bailey said she was twice threatened with jail if she didn’t obey a fake subpoena. Her ex-boyfriend was charged and later convicted of murder in a bloody street shootout. A teenage victim of molestation was served with a fake subpoena, according to her lawyer. Several days later, an investigator for the DA’s office served her a real subpoena at her school. She was threatened with arrest when she didn’t appear for a meeting. The documents, internally called “DA subpoenas,” ordered witnesses and victims to appear for private meetings with prosecutors. They appeared legitimate. They were marked “SUBPOENA” and threatened arrest and fines for failure to obey. But they were never authorized by a judge, as state law requires. New Orleans prosecutors used misleading DA subpoenas, in one form or another, for decades. Cannizzaro ended the practice the same day The Lens published its first story on it. The suit claims that the DA’s office unlawfully threatened and abused witnesses and victims to get their cooperation in criminal cases. Beyond the use of fake subpoenas, the plaintiffs allege that prosecutors misled judges in order to obtain arrest warrants for witnesses on the basis that they were refusing to cooperate, called material witness warrants. The civil rights groups say that prosecutors obtained the warrants by lying to judges or omitting material facts in their warrant applications. They also claim that some witnesses were detained for prolonged periods without going before a judge for a bail hearing. Under state law, that hearing should happen within 72 hours of arrest. In some cases identified in the suit, the two practices were related. Prosecutors allegedly lied about their use of fake subpoenas in their applications for material witness warrants. The ruling comes nearly 10 months after a court hearing on the motion to dismiss the suit. Cannizzaro’s attorneys argued that the DA and his prosecutors enjoyed immunity from lawsuits over actions they took in the course of their duties, a longstanding legal precedent. But Milazzo’s ruling kept the lawsuit largely intact, rejecting only one of nine counts against the DA’s office in its entirety. She found that immunity doesn’t apply to suits against the DA in his “official capacity” — meaning the DA’s office itself — only against individual prosecutors. As for the individual prosecutors named in the suit, Milazzo found their alleged conduct fell outside of what prosecutorial immunity is meant to protect. “This is a huge victory for chipping away at the shield of absolute immunity that prosecutors use to shield themselves from claims of prosecutorial abuse,” Hamilton said. The count she dismissed entirely was for prolonged detention. The civil rights groups wanted the DA’s office held accountable for their clients being detained in jail for extended periods of time without a hearing. But Milazzo found that getting inmates in front of a judge fell to the court, not the prosecutor. Milazzo dismissed some of the assistant district attorneys that plaintiffs had named in the remaining eight counts. She left Cannizzaro in all of them. The counts allowed to stand include alleged violations of the plaintiffs’ First, Fourth and Fourteenth Amendment rights, as well as fraud under Louisiana state law. A spokesman for Cannizzaro did not immediately respond to a request for comment on the ruling. Lower courts had ordered the agency to produce fake subpoenas from a 16-month window. With the high court’s denial, those decisions stand.